Yes, it was very informative concerning my health issues and how I can improve my health. 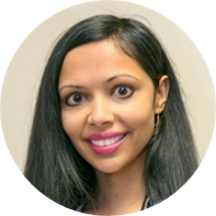 Roopa Roy is a trusted and reliable endocrinologist caring for the New Brunswick, NJ community. Dr. Roy obtained her medical degree from Rutgers New Jersey Medical School, where she also completed her residency in internal medicine and a fellowship in endocrinology. She obtained her bachelor's degree from Rensselaer Polytechnic Institute. Dr. Roy is a part of Saint Peter's Healthcare. She is board certified by the American Board of Internal Medicine. Dr. Roy is a member of the Endocrine Society and the American Association of Physicians of Indian Origin. She received the Fellowship Award by the Dancing for Diabetes Foundation, the Resident of the Month Award, and the American Association of Physicians of Indian Origin Award (AAPI) by the New Jersey Medical School. Dr. Roy is deeply committed to the well-being of her patients. She takes a thorough and precise approach to her consultations to ensure that she is consistently giving accurate diagnoses. She exhibits her passion for endocrinology in the care and precision she takes with her patients. Very pleasant. Thorough quickly taken care of.